Store and website have different and separate warranty policies. Please see store for warranty policy. Most products sold by CrazyStereo.com are covered under manufacturers’ warranty. In addition to the manufacturers’ warranty, Crazy Stereo offers additional 30 days warranty from the day of purchase on select products. Some products are Sold As Is such as: Demo product, used products, clearance items, Open-Box items. Some products are exclusively warranted by the manufacturer such as LED lights and HID Lights Kits, Wiring Kits, and Cables. Customer is responsible for all warranty shipping & handling charges. 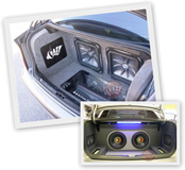 No warranty on blown or damaged speakers or physical damaged equipment. Warranty is limited to manufacturer defects only. To return products for warranty, please follow the Return Procedure.